This report provides a summary of key announcements and news being made related to or around the ASIS 2011 show. In this note, we examine the features, competitive positioning and pricing of the Axis Q1602. This camera's announcement has generated a significant amount of interest because of Axis's new Lightfinder technology. With this, Axis claims that this camera can maintain details and colors even in very dark conditions. First, let's look at the key features and then contrast it to Day/Night cameras, integrated IR cameras, EMCCD and IR illuminators. Similar general feature sets as a P-line camera: audio, on board storage, analytics, vari-focal lens, etc. Need for low light color imaging: Almost all other low light optimized products focus on providing high quality images in black and white mode (D/N cameras, integrated IR cameras, added IR illumination, thermal, etc.). The only two exceptions are white light LEDs and EMCCD cameras. EMCCD cameras are extremely expensive ($5,000 - $10,000 minimum). While they claim to provide outstanding color images in very dark conditions, given the vast price differences and likely superior performance of EMCCD, we see the products being in different categories. However, white light LEDs are an interesting option. For a few hundred dollars, spot lighting can be added. We suspect this would likely provide a better image in short range scene but would cost more overall (adding in installation and energy costs) and may create undesirable light pollution in some scenes. That noted, we see the Q1602 and cameras with added white light LED illumination as the two closest options. Value of low light color: A lot of users are willing to forgo color at night. It is not clear to us what night time applications are a 'must have' for color. Potentially, this could help identify an unknown suspect by capturing the color of their hair, clothing, car, etc. To the extent that users do not require color, many other more existing options exist (D/N cameras, cameras with integrated IR illuminators, etc.). Digital Slow Shutter as Substitute: Many cameras can provide high quality color images in very low light scenes by slowing the shutter. The downside is that this can create motion blur. However, in some scenes, it is not a practical risk. For instance, the Bosch Dinion defaults to 1/7s max exposure and is likely to provide similar detail/quality as the Q1602 in scenes with slow motion (like the above sample closet / storage room scene). Indeed, even the Axis P1343 with its default slow shutter might provide a suitable alternative. The Q1602 Absolute Low Light Performance: To the extent that the Q1602 can provide materially better low light performance in its black and white in more extreme low light scenarios than competitors, the camera could find broader use. This would be especially true if the Q1602 could do this without the motion blur problematic in using digital slow shutters. In June 2011, Axis announced a major expansion of their network encoder offerings. The release consists of a total of 5 models - (2) 4 channel units, (2) 16 channel units and (1) blade encoder. Compared to their current generation H.264 offerings, the new release provides significantly lower pricing that is quite competitive even with Asian competitors. Inside the note, we examine the features, pricing and positioning of the offerings. Before this release, the primary options for Axis encoders were in the Q series - Axis's most feature rich and expensive series. For instance, the single channel Q7401 appliance, the 4 channel Q7404 appliance and the 6 channel Q7406 blade. Online pricing for the single channel unit was ~$500 and for the 4 channel, ~$1000. The new releases are M and P series encoders. Like their camera counterparts, M and P series are less expensive and have less features than Q series products (with M being the entry level and P being the premium or 'mid level' offering). All series support PTZ control, ONVIF and AVHS (hosted video). Clearly, the newer models represent a steep decrease in pricing. While the feature sets have certainly been constrained, we believe that many users will find the P and M series feature sets to be good enough. Audio, I/O, analytics, etc. are niche applications. PTZ support is very commonly needed and is supported even with the least expensive unit. (2) 16 channel encoder appliances. Both are 1RU high, one is an M series (M7010, MSRP $1,999) and the other is a P series (P7210, MSRP $2,499). These appliances have their encoders built in. A 4 channel blade (P7224, MSRP $699) that can be inserted into the existing Q7900 rack. This is a lower cost option to the 6 channel Q7406 blade (MSRP $1499). With the new 4 channel P series blade, a total of 56 channels can be used with the Q7900 whereas the 6 channel Q series blade supports a maximum of 84 channels per rack. Given the significantly lower prices of Axis's new encoders, Axis will be quite price competitive even with the low cost encoders on the market. Vivotek is a good example of this with 4 channel and 8 channel H.264 encoder offerings. Vivotek's 4 channel unit's online price is about $630 and the 8 channel's is about $1000. Both Axis's M and P series offerings have quite close pricing with Vivotek's (on a feature set basis, the Vivotek units are a closer match to the P series, with 30fps, audio and I/O). In general, we think Axis new encoders will put price pressure on traditionally lower cost Taiwanese and Korean encoder suppliers. Given Axis's software maturity and broad support, if Axis price is similar, we think most end users would face less risk and better overall value with Axis. It will be interesting to see how and if competitors respond with lower prices. In terms of shifting users from analog to IP, we think this will have a modest shift on migration. On the one hand, Axis's new encoders do not break ground in terms of cost reduction. On the other hand, Axis's marketing power means that 'mainstream' users who prefer to go with a brand will be more likely to use Axis's lower cost. Prior to this, the cost of Q series Axis encoders was generally more than an entire mid level Hybrid DVR including embedded VMS software and storage. Now, the total solution pricing is much more comparable. One interesting future element is combining these low cost encoders with iomega NAS devices for AVHS deployments. A 1RU 16 channel encoder for $1999, a few TB NAS for under $500 and AVHS service could be an attractive package for retail chains. We suspect Axis is looking at this given their announcement of these new encoders on the first day of the NRF LP show. Price - The new NEI30IP has an MSRP of $4400 USD while the old EX30Ip had an MSRP of $3388 USD - an approximately $1000 MSRP increase. In practical / end user terms, the difference in price is likely to be $500 - $700. Historically the EX30IP online pricing was ~$2,000 USD. We expect the NEI-30IP pricing to be about ~$2,500 USD. Dallmeier's Panomera Megapixel camera series announcement likely drew the most interest of any new product introduction at the IFSEC 2011 show. The two most novel claims Dallmeier made was that (1) the Panomera provided up to 51MP resolution and (2) that the Panomera camera could deliver the equivalent of up to 215 MP of resolution. These would far outstrip any offering in the marketing. In this note, based on an detailed discussion with Dallmeier, we examine the features, pricing and positioning of the Panomera camera series. Panomera is a multi-imager camera systems that uses multiple cameras inside of a single housing. This is not simply one, super 'big' camera like the Avigilon 16MP. Panomera uses rows of MP cameras inside the housing. The lowest resolution version provides 3 cameras in a row. Other versions offer 3 rows of 4 cameras (total 12). The maximum resolution version incorporates 17 3MP cameras providing the maximum 51MP. Dallmeier claims, "If you tried to achieve this quality with a conventional megapixel camera, you would have to use a camera with 215 megapixels"
Supports H.264 resolution, 1080p/30fps and 3MP/14fps. The first generation of the series, currently shipping, does not offer a mechanical cut filter. The second generation, scheduled for Q1 2012 will add this. Currently, no 3rd party VMS sytems support the camera. However, Dallmeier says that Panomera uses an open API and that several manufacturers plan to integrate with it in the future. The pricing ranges from 3,500 Euros for the entry level to 30,000 Euros for the high end model. That's roughly $5,000 to $50,000 in USD. Panomera states that their decisive advantage is: "completely novel lens and sensor concept. For conventional HD or megapixel cameras, this means that the indicated resolution, let’s say, 12 megapixels, is evenly distributed on the entire viewing angle. The farther you now 'move to the back'of the scene, meaning, zoom into the picture, the higher the loss of detail, causing the picture to become blurry. By contrast, with innovative geometric construction principles, Panomera uses its megapixels such that even objects that are farther away can be displayed with the same resolution as objects in the foreground of the picture." We believe that Dallmeier is using different focal length lenses for the individual cameras within the 'box' to achieve this and the 'equivalent' 215 MP resolution. Additionally, Dallmeier provided us a comparison of installing Panomera vs traditional megapixel and the video quality achieved by Panomera vs traditional megapixel. We believe that this series may find a niche for very large scale areas such as stadium. However, we believe this offering is overhyped and can generally be substituted with simpler, cheaper commonly available alternatives. Without a mechanical cut filter, we would anticipate very poor low light performance. This is a real problem because the outdoor environments where this camera is most likely to be used almost always suffer from low light challenges. When the second generation version is released (planned for Q1 2012), this should be resolved. Without 3rd party integration, it will be hard for most anyone to use this camera. It could take a year or more for other systems to support. The cost is fairly high - even for the entry level version. There are many multi-megapixel camera offerings available for $1,000 or less. Most importantly, we think most users could achieve the same basic results by mounting a few megapixel cameras on a pole (or using an existing multi-imager camera such as the Arecont or Avigilon units). At some level, it appears that this is basically want Dallmeier has done - mounted a variety of megapixel cameras with different focal length lenses into a single housing. On the positive side, if you really need to cover a very large area or cover it 'densely', we think Panomera may be a more elegant solution than trying to hack one's own multi-camera setup. Last, and perhaps most strongly in favor of Dallmeier, people love big numbers and higher resolution (e.g., the IFSEC award and buzz). Many, many people will equate the higher resolution with being the best, which is certainly powerful from a marketing perspective. We think this is overhyped and most users should look to building their own that has a mechanical cut filter, supports their existing VMS and is a cheaper (perhaps substantially) than Dallmeier's. In this note, we examine DVTel’s announcement of their Quasar line of HD cameras. 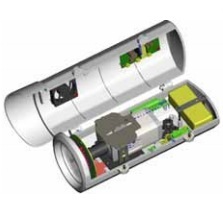 This release includes multiple models of fixed and minidome cameras: The CF fixed camera models, and the CM minidomes. Each of these is available in either 1.3 megapixel/720p or 1080p versions, with true day/night and wide dynamic range functionality in all models. Compared to the current generation of DVTel's HD cameras, the HD Classic and Elite models, the Quasar lineup features multiple improvements, such as improved nighttime sensitivity and digital noise reduction, and increased frame rates while dual-streaming. Continuing in the tradition of the previous generation of cameras, Quasar CM minidomes will be part of their Snap-In Camera System. This allows dome housings to be reused simply be replacing the camera module with a new electronics package. 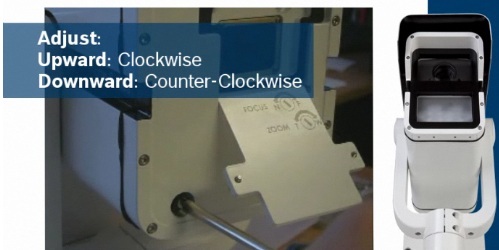 This reduces overall cost by eliminating some hardware cost, and reducing installation labor. The CM series domes are also available with motorized lenses which enables remote zoom functionality. This functionality is found in some competitor's cameas, such as Pelco's Spectra. DVTel also claims the Quasar line improves performance thanks to two proprietary features: Scene Adaptive and Smart Picture Quality algorithms. These algorithms adjust picture settings such as gain control, sharpness, and contrast as well as auto-iris and exposure controls based on user thresholds to maximize picture quality and reduce bandwidth needs. DVTel claims these features provide a competitive advantage. Since they are not yet released and we have not tested them, we cannot provide an opinion. All Quasar models also feature an on-board SD slot for local recording. Video clips stored on the SD card may be emailed or uploaded via FTP upon event, or accessed via the camera’s web browser interface. Once downloaded, users of DVTel’s Latitude VMS may also access these video clips for use in CaseBuilder, their investigative and incident reporting tool. 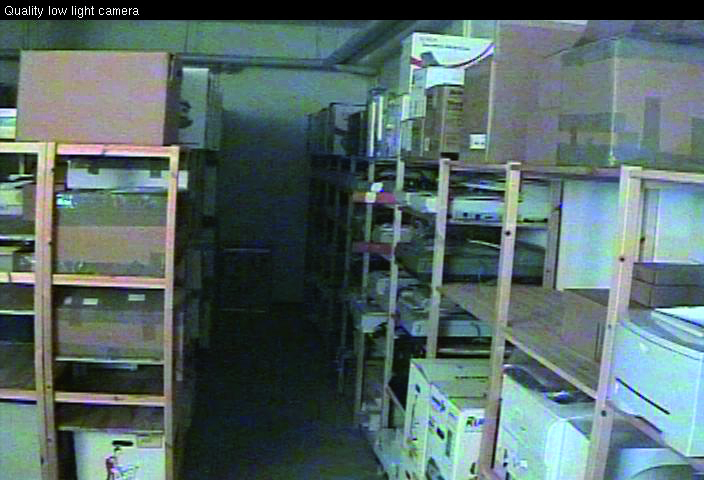 While not as full-featured as edge storage functions found in other VMS's (see Genetec, March Networks, Axis, or Mobotix), this support for edge storage is an improvement over many manufacturers, which require users to at best, access the camera via web browser, and at worst, remove the flash card from the camera, in order to view stored video. Introductory Quasar models will support current ONVIF specifications (version 1.02.2). When ONVIF 2.0 is adopted, all Quasar models will be updated to the 2.0 specification through firmware. Moving from an end-to-end software and camera supplier to a more open supplier of devices which may be used on third-party ONVIF-compliant systems should serve to strengthen their position in the industry. However, being a DVTel-only dealer line limits how many integrators will choose to use these cameras with third-party NVR's. We imagine most DVTel integrators with access to these cameras would choose to use them with DVTel's own software. The Quasar line will be available in Q3 2011. The CM-3211 indoor 720p minidome will have a $719 MSRP. Quasar CF fixed cameras range from $849 to $995 (720p and 1080p, respectively), not including a lens. The pricing will likely be fairly competitive to cameras with similar feature sets (megapixel, WDR, D/N, SD card support, etc.). DVTel uses a traditional security dealer discount structure so street pricing should be notably lower than MSRP. We suspect the overall pricing, after adding in cost for lens for the fixed cameras and factoring in discount structure will be similar to Axis P series pricing. Over the last 2 years, interest in VSaaS has risen significantly yet most of the providers have been startups and small companies. Now, EMC, a giant storage provider with nearly $20 Billion annual revenue, is launching its own VSaaS service. In this note, we examine the structure, pricing and positioning of EMC's offering examining if EMC can overcome the problems holding back many of today's current VSaaS providers. The total package consists of EMC's implementation of Axis' AVHS, integrated with their Atmos cloud storage platform. The user interface to EMC's VSaaS has been customized beyond that of the typical Axis' AVHS interface, although it is unknown to what level. Local storage at client sites can be served by the Iomega StorCenter NAS appliance at each site, reducing bandwidth and remote storage needs. EMC has targeted large national integrators with this offering, providing accounts to these integrators at wholesale pricing, who will resell the service to end users. With many of these integrators providing in-house central station monitoring, EMC has integrated AVHS with the central station monitoring software used by some, allowing video from the could service to be used for alarm verification. Unlike many VSaaS providers, EMC meets SAS 70 and ISO 27001 standards. Readers may remember Axis' controversial claim that these must be met for hosted video implementations and our analysis and counterpoint. Expected end user pricing is between $10 and $15 per camera per month, in line with other offerings. With 25% market share in direct-attached storage, and nearly 30% in network storage, EMC certainly has an experience advantage over other vendors. We examined the VSaaS market about a year ago, citing a number of issues prohibiting widespread adoption which still exist today: concerns about storage and bandwidth, network security, and pricing all were major issues. EMC, being the giant that it is in the storage industry, mitigates some of these concerns. Few, if any, competitive offerings could boast the sheer numbers of installations. This is likely to ease concerns over reliability and security which end users may have with VSaaS in general. Additionally, adherance to SAS 70, ISO 27001, and RSA Encryption standards puts EMC ahead of most of the market. One complaint in reviewing various hosted video services was the user interface. Since it is normally web-based and made to work across browser versions, it's usually simplistic, and limited to simple views of a few cameras. This makes live operation and archiver viewing often cumbersone, and not as feature-rich as full-blown client software. Integration of VSaaS video to third-party systems are also unheard-of. According to our contact, EMC says that they are capable of customizing the interface of their hosted service beyond that of the standard AVHS. How much of this customization has been finished and how much is planned is unknown, though if forced to guess, we would assume little to none in the time period the service has been available. Another complaint, and perhaps the greatest, about VSaaS is pricing. In our research we found that $10-20 per camera per month was typical for most VSaaS providers. This number is subject to change depending on the storage duration required, and number of cameras. EMC's offering reportedly will price out at the same level. Our concern remains that this pricing is simply too high for many users. With even low-end DVR's costing $300 featuring remote access and even iPhone clients these days, $400-700 per year for a hosted service seems a difficult sell. Customers desiring a few HD cameras may find hosted services more attractive, since low-cost DVR's can't provide greater than standard resolution. Overall, while EMC offering VSaaS is more attractive them some lesser-known providers, thanks to their brand and experience, we feel they will face many of the same challenges of other providers until pricing drops to more reasonable levels. A Silicon Valley startup, Evoz, is receiving extensive tech press coverage for a new baby monitoring service that incorporates audio analytic technology. In this update, we examine the potential for Evoz to be disruptive to the home monitoring / surveillance / security market considering their upside potential, risks involved and competitive alternatives. The service can be monitored from mobile devices and in the near future a general web interface. By comparison, almost all of the many current baby monitors are local listening only (inside the home, direct proprietary connection). The service integrates audio analytics to detect if a baby is crying. The company claims to be able to detect / alert accurately in the presence of background noise. A few crying alert monitors exist but they are relatively basic and likely prone to false alerts. The service generates ongoing reports (see image sample) tracking a number of parameters such as how many times the baby cried, how long the average cry was for, how significant the noise level in the room was, etc. The monitor in the baby's room can be either an iOS device (like an iPod Touch, minimum price $229) with an app loaded or, coming this fall, a dedicated Evoz monitor starting at $120. Systems / kits purposely built for baby monitoring. These kits average about $100 and come with a monitor and handheld receiver. The devices communicate over a proprietary wireless connection for use within a home. The receiver device needs to be carried around and it does not work outside of the house (on the road, at work, etc.). Many include video as well. For background, see our test results of Lorex's baby monitor. Webcams with audio used for baby monitoring. These are traditional low end IP cameras adapted for use as a baby monitor. The camera cost about $100 - $150 and the user monitors with their PC, mobile phone, etc. Questions: How well does the audio analytics work? How useful is the reporting? Ultimately, we think the overall differentiation of the company rests on the crying alerts and reporting. That will need to justify the premium cost of the product. On the one hand, Silicon Valley is an echo chamber. Right now, the tech publications act like this is the world's only baby monitor worth considering. The reality is that there are a lot of alternatives, most significantly cheaper and some with more functionality (like video). On the other hand, this is the first and only company we are aware of that has dedicated real technology resources to this specific problem. As such, we do think it has potential as a premium offering in the market that could disrupt and undercut the more basic offerings from traditional home / DIY manufacturers. In this note, we examine the features, pricing and positioning of the first gigapixel surveillance camera ever released. This offering is from ipConfigure and is called the GWAS or Gigapixel Wide Area Surveillance. Gigapixel photography has gained significant mainstream interest. Gigapixel offers a massive amount of resolution and is pretty amazing to view. (See for yourself by scanning through this gigapixel image gallery.) As its name implies, gigapixel images deliver 1000 times the resolution as a megapixel camera (1 Billion+ pixels). To do so, a camera moves across a scene capturing areas piece by piece and then stitches that into a single image. The clear upside is that you now have massive resolution displayed in a single image. The most obvious downside is that it takes time to move a camera across a wide field of view, resulting in image generation latency and ghosting affects (where a subject is only partially captured - see sample ghosting image). Like photography, ipConfigure takes the same basic approach for creating a gigapixel camera - a moving camera scans an area and creates an image. The user can define areas for the camera to scan. Sample patterns include 270 degrees by 30 degrees and 93 x 30 degrees. ipConfigure estimates that a complete scan takes about 70 seconds for the former and the 24 seconds for the latter. If the unit with dual scanning imagers (on the right) is used, the time can be cut in half. Either way, this is not a real time surveillance camera and users should expect 1 image per X number of seconds. The camera requires a server for processing / stiching the image. Only ipConfigure's own VMS supports the camera. A future API will allow third party systems integrate with ipConfigure VMS as a whole but not the camera directly. Cost: The MSRP for the base unit is $95,000 USD; with Thermal, the MSRP is $145,000 USD and the Dual Array with thermal is $299,000 USD. A future version with a less expensive IP camera will cost significantly less. Price: At its price, this is almost certainly a device for critical infrastructure - sites with clear risks and million dollar budgets to spend on surveillance. You would not likely need a lot of these cameras per site but the starting price constraints potential buyers. On the other hand, for those with real security risks, this could be a very powerful overview shot - likely more useful than a 3D map and at a similar costs. Latency: Users must have the right expectations on how they use this camera. If they expect to zoom in and seeing a suspect running or driving through in real time, they will be quite disappointed. Using it more like a massive resolution time lapse photograph could work well. Also, using it to orient oneself and then use a PTZ for tracking can also be helpful. 3rd Party Restrictions: Since you have to use ipConfigure's VMS (or in the future integrate their VMS into your PSIM), this limits who can use it without switching to ipConfigure. This noted, just like the Dallmeier Panomera that generated significant interest, we expect there to be many inquires into this product because it is unique and offers unmatched total resolution. In this update, we examine the latest release from megapixel camera manufacturer IQinVision, an update to their Sentinal series of pre-packaged outdoor cameras. The Sentinel series of cameras is a line of fixed megapixel cameras, supplied in a NEMA 4/IP66-rated housing for outdoor use. These cameras are available in resolutions ranging from 1.3 megapixel to 5 megapixel. The line is available with a variety of lens options, ranging from 5-50mm telephoto to 1.8-3mm wide angle. The Sentinal line's most commonly cited benefit is ease of installation. First, it is an outdoor ready camera eliminating any need nor issues in manually installing an indoor camera in an outdoor enclosure. 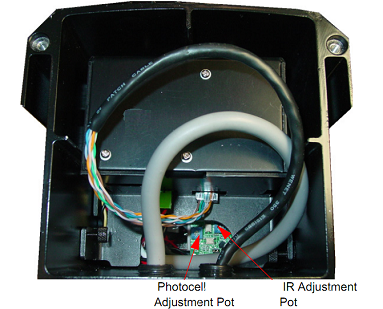 Secondly, the design of the camera allows the backbox to be hung prior to making connections, so the installer may use both hands to finish installation, without having to support the camera (see a visual overview of this setup). Some installers may find the Sentinel's 110 punchdown (similar to the back of a patch panel) termination easier than terminating an RJ45 modular plug. This is a matter of preference, however, and realized labor savings (perhaps a few minutes) comes down to the skills of the individual installer. This release essentially adds two new features to the line. The entire line is now multi-stream capable, with either MJPEG or H.264 Main profile streams. Prior to this release, only the Sentinel 832 model was H.264 capable, with all other models streaming only MJPEG. The addition of remote focus capability to the line. This allows users to initiate auto back focus with a one-touch capability, or to manually adjust focus remotely. The user is also capable of setting up a focus window, to direct the camera to focus on one portion of the field of view. This release is essentially catch-up for IQinVision, as most major manufacturers have supported H.264 for the past year or more and many of the big camera manufacturers have added in remote focus and even remote zoom. There are few, if any, cameras which deliver the exact same features as the Sentinel seires. We know of no other IP cameras offering the option for 110 punchdown, for example. Axis has made steps to ease installation with their -E models, such as the P1346-E, which ship cameras with the proper housing and wall mount, along with an outdoor network cable. However, the Axis models still require more steps to installation than the Sentinel series. The new Sentinel series cameras are the same price as their existing counterparts and should be cost competitive in the premium side of the market. Comparing competitive outdoor megapixel cameras, the 5-megapixel Sentinal IQ855 can be found online for about $1,300. The Axis P1347-E can be found online for about $1,600. At the lower pixel counts, pricing is closer, with the IQ851 (1MP day/night) and the Axis P1344-E both selling for about $1,100 online. Using IR is a very common way to improve night time lighting, especially with the proliferation of megapixel cameras. Two of the biggest downsides of IR is that it can be costly and cumbersome to add IR illumination. In this note, we examine camera housing that integrate IR for a potentially much cheaper and simpler deployment. 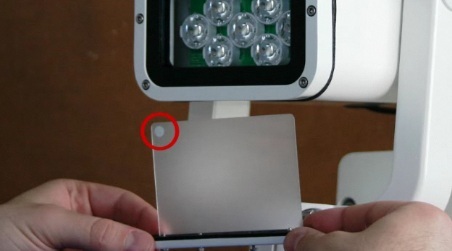 External IR illuminator - a separate device mounted near the camera to provide IR illumination (manufacturers include Raytec, Iluminar and Bosch - see our IR illuminator review). Cameras with Built in IR - a growing trend, a number of manufacturers are adding IR directly into the camera body. We found two options: Messoa SLI070HB and the Vivotek AE2000 (both approximately $250 online). These units consist of an aluminium outdoor camera housing with heater blower, equipped with a ring of IR LED's at the front of the housing. This setup allows any standard fixed camera to fit in the housing, and gain the benefits of built-in IR. 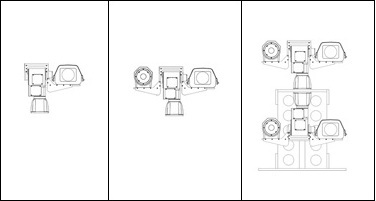 The Vivotek housing is spec'd for 80m (260') illumination range, while the Messoa unit is spec'd for 70m (230'). As discussed in our IR Illuminator Performance report, we would not trust these range figures without testing, as manufacturer-cited ranges are often overstated. 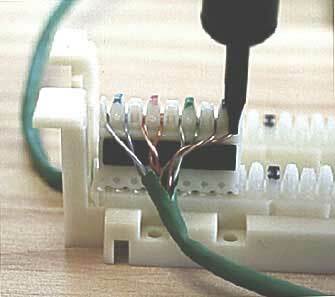 The main advantage of housings such as these is simplicity. 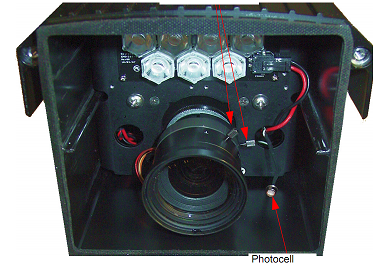 Instead of mounting an outdoor camera housing, then mounting an IR illimunator along with it, the installer simply installs the camera in the housing and connects and focuses the camera. It certainly will reduce installation time, and simplifies cable management, since no cables need to be run between the camera housing and an exterior illuminator. Additionally, it allows the user to select any preferred camera, unlike camera models with built-in IR. Typically, there are few cameras of this style in a given manufacturer's line. They also tend to be fixed lens, or short varifocal lenses, such as 3-8mm. Using a housing like this allows any camera and any lens to be used. The main disadvantage we see is lack of flexibility. The Messoa housing has a fixed 50-degree angle of illumination, while the Vivotek is adjustable from 25-45 degrees. While these may cover many applications, external illuminators are available with angles from 10 to 180 degrees, so the illuminator may be adjusted to more exactly match the camera's field of view. Also, most external illuminators have output controls to allow the user to decrease output to only what is necessary. This is a key capability if hotspots and overexposed images are to be avoided. Finally, while these housings both have rather long ranges, illuminators are available elsewhere with ranges of over 1000'. Most applications for fixed cameras do not require anywhere near that range, however. We would estimate that the 200' mark is more than enough for most applications. Even at that range, pixels on target is very small unless the field of view is extremely narrow. When compared to most major-name exterior IR illuminators, these housings are much lower in price. A Raytec RAYMAX 100 FUSION illuminator sells online for $775. An Illuminar IR-312 series sells for approximately the same price. Models from YYTrade and the like are much less expensive, retailing for about $70, albeit without all the same features. 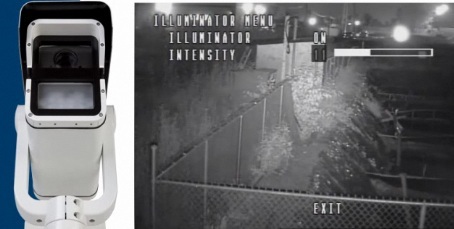 Beware, however, because lower-cost IR illuminators typically have drastically overstated illumination ranges. Standard exterior camera housings with heater and blower cost about $150 online, making the upgrade to these models with built-in IR about a $100 upgrade. At this price, one could practically purchase the housing, as well as a camera and lens before hitting the $900 mark. Add the increased efficiencies in installation, and the difference becomes greater, making the installation much less expensive overall. That being said, as stated above, we recommend evaluation of these housings before wide-spread use. The big three names in illumination, Raytec, Bosch, and Illuminar, all are known for having a more even output than less expensive illuminators, resulting in fewer overexposed areas. Without careful application, IR illumination can be just as bad for image quality as low light conditions. We also cannot state enough that manufacturer specifications for illumination range are often overstated by 50% or more. Simply put, installation efficiencies and lower overall cost won't matter if the illumination just doesn't work. Incompatibility between cameras and recorders are a major source of concern. 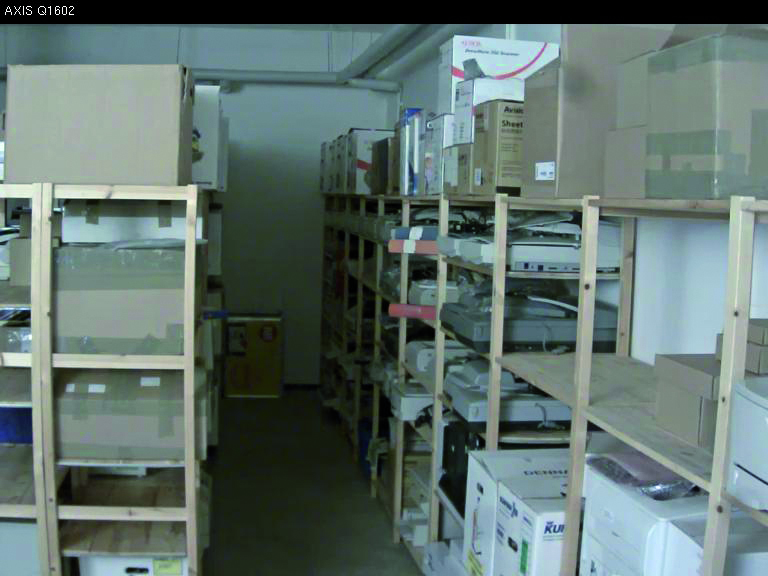 It is an issue that the HDcctv Alliance has repeatedly raised and criticized for IP cameras. Now, with the Alliance announcing its Version 2.0 specification, they are confronting their own interoperability problems as a schism grows between Alliance providers and HD SDI offerings. In this note, we examine the issue, the potential problems and future impact. The HDcctv Alliance itself sees this as a growing concern. In an August 2011 presentation in Beijing, the Alliance stresses the importance of using HDcctv certified products rather than HD SDI. Specifically, the Alliance notes that V1.0 HDcctv is more than HD SDI and that V2.0 HDcctv is not guaranteed to work with HD SDI. The challenge is that, while manufacturers are experimenting with digital HD video over coax, many are implementing HD SDI products, rather than conforming to the HDcctv specification (e.g., the HDcctv Compliant Product Finder only returns 3 manufacturers of compliant cameras). As a practical issue today, according to HDcctv sources, this is unlikely to be a real world technical problem. Interfacing non compliant HD SDI cameras to Version 1.0 recorders should still work. Going forward, as the HDcctv Alliance evolves its specification, the practical issues will become significant. For instance, the HDcctv Specification 2.0 supports much longer cable runs (based on the Gennum Aviia reference design). To achieve these longer runs, modest levels of encoding will occur on the camera side and decoding on the recorder side. As such, connecting an HDcctv V2.0 camera to an HD SDI recorder is unlikely to work as the electronics will be fundamentally incompatible. The HDcctv Alliance understandably recognizes the importance of ensuring interoperability. Having various incompatible HD digital products will cause customer dissatisfaction, limit growth, etc. No large surveillance company leadership: The three core members do not have significant status in the surveillance industry (CSST is in trouble and invests almost nothing in R&D, Gennum is an outsider and Stretch is a component supplier). There is no company to 'rally around.' Like Axis or not, Axis was big enough that many small manufacturers choose ONVIF to piggyback off Axis's efforts. Controversial / Negative promotion: The HDcctv Alliance has engaged in an unprecedented negative campaign that has alienated or scared many in the industry, even potential allies. We looked at this last year: "Is the HDcctv Alliance Shooting itself in the foot?" These tactics continue today unabated. Conflict of Interest: The Executive Director of the HDcctv Alliance has started his own manufacturer/reseller, the eponymously named Rockoff Security with the motto of "The First Name in HDcctv" that competes with HDcctv Alliance members. In May 2011 JVC announced a new HD camera line called Super LoLux HD. This is a major expansion for JVC consisting of almost a dozen new cameras covering a variety of form factors and options. Additionally, three of the 'flagship' features included are: H.264 high profile compression, JVC's CLVI image processing and Super LoLux sensitivity. Inside this note, we examine the key features, their pricing and competitive positioning. Integrated Housing Camera: VN-H157WPU: An enhanced bullet form factor, the H157WPU features an integrated sunshade and internal cable channels for better reliability and vandal resistance. Unlike bullet cameras, this form factor is physically supported in two points instead of one, for better stability. Compared to existing JVCmodels, the Super LoLux HD line has a number of advances. Let's examine each of them. ONVIF/PSIA support: All models in this line adhere to both ONVIF and PSIA standards, a feature which is found in few other cameras. Cameras currently suppot the most recent versions of both of these specs, with plans to implement later specs through firmware updates. H.264 high profile compression: All Super LoLux HD line support H.264 High Profile. Theoretically, this should deliver lower bandwidth consumption for the same quality levels compared to the more commonly used H.264 Baseline Profile. Super LoLux HD sensitivity: The namesake feature of this line, JVC's Super LoLux technology is intended to provide clear color imaging in low-light conditions, much like Axis' recently announced Lightfinder technology. This technology is reported to assure color imaging at 0.5lx without any sort of slow shutter, automatic gain control adjustments, or other "tricks" which could create motion blur or noise. We will need to test this to understand its competitive positioning. CLVI noise reduction: A JVC proprietary enhancement, CLVI (Clear Logic Video Intelligence) is an image processing method which allows for multiple image enhancements, such as wide dynamic range, digital noise reduction, and digital removal of fog and smoke. CLVI is currently in use in analog cameras in PAL territories. This release is the first time it is available elsewhere, and in network cameras. The 720p Color Only camera (VN-V17U) has an MSRP of $399, lens excluded. The 1080p D/N camera (VN-H37U) has an MSRP of $599, lens excluded. The 1080p D/N camera (VN-H137U) with an integrated optical zoom lens has an MSRP of $650. Vandal Proof Domes: The VN-H157WPU and vN-H257VPU are the line's most expensive offerings with an MSRP of $1,299. Historically, the online price of JVC's cameras are about 10-15% lower than their MSRP. By feature, the Color Only 720p camera (MSRP $399 w/o lens) is similar to Axis's M1114 with an MSRP of $549 (with lens). Pricing is also similiar with JVC likely having a modest advantage. By feature, the D/N 1080p camera (MSRP $599 w/o lens) is similar to the Axis 720p P1344 ($849) and/or the Axis 3MP Axis 1080 P1346 ($1099). JVC pricing, even after factoring in the additional lens price, is significantly less. Can Navco's VideoMetrixs VSaaS Compete? US national security integrator Navco is the latest to throw its hat into the VSaaS ring with an offering called Videometrics. One immediate differentiator is a new twist on the pricing/packaging of the overall solution. However, we do think it is enough to make the offering competitive, suffering from similar fundamental flaws of the many copy-cat VSaaS providers launching monthly. It uses Axis AVHS and as such only supports Axis cameras. It is hosted/managed via EMC's VSaaS hosting solution (that incorporates Axis AVHS). No NAS devices (such as iomega) or on site storage is supported. All video is streamed off site. Up to 4 IP cameras are supported and the user can pick from Axis box, dome, vandal dome or zoom cameras. 7 Days of continuous recording and 30 days of alarm recording are included. No Megapixel cameras are supported. Contracts range from 1 - 3 years with significant price declines for longer contracts (e.g., the 3 year plan is nearly half the price of the 1 year plan). Optionally, customers can purchase without a contract or after a contract concludes at $15 per camera per month. Per camera pricing (including camera) is ~$50 per month for 1 year and ~$28 per month for 3 years. This is for a simple box camera with a fixed lens (we suspect it is the Axis M1103). No volume discounts are provided (e.g., the per camera price of a 4 channel system is the same as a 1 camera system). The contract includes rental of the camera so the user does not need to separately purchase the camera. The camera is returned to Navco at the end of the term if the user cancels. The contract does not include installation. Installation costs include a flat fee of $150 and $100 per camera for indoor, 50 foot or shorter runs. Service/maintenance costs are included in the contract. Navco says that with their VSaaS offering, you can get a new video system for $1 per day. While this is true (at least for 1 camera with Navco), you would likely get the equivalent analog system for a quarter. The problem is that there is little to differentiate this from an analog system except for the massive increase in price. You almost have to get the multi-year contract because the one year plan is comically expensive (e.g., ~$200 per month for a 4 camera system). Even with the 'cheapest' 3 year contract, the comparative cost increase is quite significant. A 3 year plan with 4 SD cameras is minimally ~$110 per month or nearly $4,000 and that does not include installation (which is another ~$500). Supporting MP and adding on a NAS would likely make the solution much more competitive. We would expect (or at least hope) to see this added in the future. For more on VSaaS ROI issues, read our VSaaS ROI analysis. A new iPhone application supporting Milestone's VMSes, named Hawk-i, has been released. While many affordable options exist for surveillance apps generally, until now the only apps supporting Milestone's VMS were extremely expensive. This had placed Milestone, one of the most frequently cited VMS providers, at a competitive disadvantage. In this note, we examine the positioning of Hawk-i and contrast it to LexTechs Labs, the most commonly used Milestone mobile solution. Supports live monitoring, recorded video review, PTZ controls, etc. As such, we would expect Hawk-i to be an attractive option for small to medium size Milestone deployments that only need a few mobile clients and want to save thousands vs LexTech. By contrast, larger operations (such as campuses) who need dozens of mobile operators and want to facilitate sharing with third parties, are more likely to be willing to spend the significant premium on LexTech. For Milestone, while many VMS vendors are now providing mobile apps for free, we believe Hawk-i will significantly reduce the competitive disadvantage their mobile offering had previously.